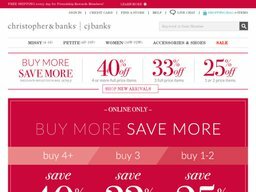 15% OFF + Extra $20 Christopher & Banks Coupon - Verified 27 mins ago! Undeniably, many women turn to fashion as a means of self-expression and empowerment. Feeling good about what you are wearing and the style that you are portraying can help to strengthen your confidence and make you feel better about yourself in social situations. However, it can often be challenging to find clothing in the styles you love when stores don’t always carry the appropriate sizes. Aiming to meet the demand for these sizes, Christopher & Banks carries women’s clothing in a wide variety of sizes and fit options. Although these often varied sizes can cost additional money, when you use a Christopher & Banks coupon, you can ensure that you get access to the sizes you need at a reasonable price. Details: Get $20 off $100 or more. Exclusions: Not valid on All Bottoms. Not valid for Sale, Clearance or Ultimate Values. Not valid on gift boxing, applicable taxes or shipping charges. Discount is off of original ticket price. May only be combined with Friendship Rewards Certificates but discount will be applied before Certificate. Details: Get 25% Off Full Priced Items Sitewide. Offer valid on full price styles only. Not valid on All Bottoms. Exclusions: Sale, Clearance, and Ultimate Values. Details: Get 40% - 50% Off Everything. Christopher & Banks had its first introduction to the world in 1956 when Gil Braun opened a store in Minneapolis, Minnesota known as Braun’s Fashions. The store was opened with the goal of providing women with the clothing they would need to feel empowered and ready to face anything. By 2000, multiple stores would begin operating under the new Christopher & Banks name, later followed by the introduction of CJ Banks, which opened 20 more stores that were designed specifically to cater to women sizes 14 - 24 in the apparel market. Realizing that these sizes were often underserved, Christopher & Banks formed a goal of ensuring that women would be able to have access to clothing in any and every clothing size they needed. To date, Christopher & Banks now operate over 500 stores throughout the nation. Are you looking for information about Christopher and Banks printable coupons 2016 or the latest CJ banks coupon? If so, you’re certain to find all of the information you need here on Coupofy. Even if you’ve never shopped at Christopher & Banks before, our detailed review of this popular clothing company will provide you with everything you need to know before you commit to making a purchase. Whether you are curious about the quality of the merchandise or what you can expect to pay for shipping, Coupofy has all of the information to ensure that you don’t miss out on any potential deals and savings. Why Shop at Christopher & Banks? Christopher & Banks carries sizes that are typically more challenging for women to find while shopping at most clothing stores. These sizes include Missy ranging from 4 to 16, Petite ranging from 4P to 16P, and Women ranging from 14W to 32W. Although these are sizes that many women still commonly wear, they are often underserved as many clothing stores and brands continue to cater to sizes that they believe are more common and more popular. Acknowledging this gap in providing clothing to appropriate demographics, Christopher & Banks aims to solve the issue by providing women of all sizes with the clothing that they need at prices they can afford. Like any clothing store, Christopher & Banks carries much of what you would expect including pants, jeans, shirts, blouses, skirts, dresses, and much more. 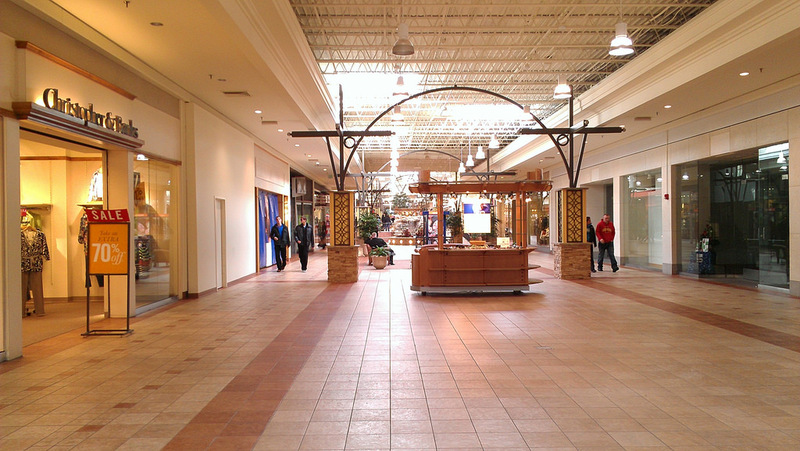 The company also offers a variety of shoes and accessories for your enjoyment. Merchandise is provided in an assortment of styles and trends, so it’s easy to find something that will meet your personal style and help you express yourself, whether you’re searching for something to wear for a night out or you need something more conservative for another day at the office. There is truly no limit when you are shopping at Christopher & Banks, so you’ll want to spend some time browsing to get an idea of just how many options are really available. If you are not shopping for yourself but you are shopping for gifts for someone else, you will want to brought through the gift shop and the collections portion of the site. This is a great way to get a general idea of the many different looks that can be created, new releases, and find a few great options that can pair well with nearly anything or make a great surprise addition to someone’s wardrobe. While the clothing at Christopher & Banks is not expensive at all, it is truly durable quality and presented at reasonable prices. Acknowledging this, you will still want to make use of a Christopher & Banks coupon every time you shop if you are going to make the most out of your purchase. Knowing where to get your Christopher & Banks promo code and the best time to use it is going to be helpful if you want to save money when shopping on this website. Like many stores, it pays to know how to shop smart and if you are careful, you can truly find some great deals while you are shopping online with Christopher & Banks, even if you are not shopping directly at a CJ Banks outlet. Aside from coupons, you’ll want to take advantage of the company’s loyalty program for access to exclusive deals. This is highly recommended if you plan on shopping at Christopher & Banks a lot in the future or if you just want to always ensure that you have access to some of the most exclusive deals that the store has to offer. Understandably, credit cards are not an option for everyone, but if you have any interest in signing up for credit with this store, it’s another way to help you save money and increase your spending power in the long run. If you have been searching for Christopher and Banks coupons 2016, there are a few various ways you can get access to these deals. The first thing you will want to do is sign up for Christopher & Banks email newsletter when you visit the site. This will provide you with information about the latest sales, promotions, and coupons that become available on a regular basis. You will receive a new Christopher & Banks promo code whenever it becomes available, ensuring that you’ll never run out of potential discounts. Christopher & Banks also has a page dedicated to coupons on its website, so if you have any doubt about what the latest coupons are or if you haven’t subscribed to the email newsletter, you can still have access to the most recent discount that’s been released. Visit this page every time you shop at Christopher & Banks because it’s a great way to ensure you don’t miss out on any savings on your next purchase. If you like using social media, you can also follow Christopher & Banks there for potential savings. Christopher & Banks can be found on Facebook, Pinterest, Instragram, Twitter, and YouTube. You can also sign up for SMS updates through the site as well. Signing up for social media updates is highly recommended because it can provide you with some coupon and promo codes that won’t get posted anywhere else by the company. If you plan on doing plenty of shopping at Christopher & Banks, you’ll want to sign up for the rewards program to ensure that you don’t miss out on potential deals and savings. The Friendship Rewards program provides you with a number of benefits including 10% off your first purchase, 250 bonus points for enrolling, 10 points per $1 spent at Christopher & Banks, free standard shipping on any online order and a $10 reward when your earn 2,500 points. If you don’t like dealing with shipping fees when you shop, joining the rewards program is worth it just for the free shipping. This means that you will have free shipping even without the use of a Christopher & Banks free shipping code. Likewise, the points scale for each purchase at Christopher & Banks makes it very easy to build up enough points for your $10 rewards on a regular basis, making this a fairly useful program for discounts if you like shopping at Christopher & Banks frequently. Another potential way that you can save money when you shop at Christopher & Banks is to sign up for the company’s credit card. Although credit cards are not an option for everyone financially, if this is something you are willing consider, you can receive access to a few extra benefits that you won’t get with the rewards program. Credit card holders will receive benefits such as 15% off on their first purchase, 500 points for enrollment, 15 points for every $1 spent, free standard shipping on any online order, $10 rewards for every 2,500 points earned, exclusive events for credit card holders, and a bonus coupon. In this sense, the credit card can be more beneficial because it will provide you with additional opportunities for savings that you wouldn’t otherwise encounter just being on the rewards program list or signing up for the email newsletter. Additionally, there are various tier levels that you can receive when you have the credit card. Silver tier receives surprise bonuses for birthdays and membership anniversaries, while Gold tier receives all of the silver benefits plus 2 special savings events. If you reach Platinum tier, you will receive all of the Gold benefits,but you will also receive an additional special savings event and an exclusive invitation to join the Christopher & Banks Style Advisory Board, which is truly a treat if you love shopping at Christopher & Banks. Combine all of these discounts with a Christopher & Banks coupon and you’re certain to save a lot of money using this option. Spend some time browsing on Christopher & Banks website and you’re certain to find plenty of clothes that you’d love to add to your wardrobe. When you’ve added a few items to your cart and you’re ready to checkout, the process is simple and easy. When you check out, you will need to provide information about where you are shipping your items and how you are going to pay for your order. You can also provide your Christopher & Banks coupon during this time to apply your discount. When you apply your Christopher & Banks promo code, the discount should be shown in your final total immediately. If you don’t see any discount applied or you see there’s an error code on the screen, you might want to try inputting the code again. If that doesn’t work, we recommend trying a different Christopher & Banks coupon for your discount. Why Didn’t My Christopher & Banks Coupon Work? If you weren’t able to get your Christopher & Banks promo code to work during checkout, it’s possible that it may have expired. Coupons must be used within a specific period of time, otherwise they will expire and be replaced by other coupon codes. It is also possible that you haven’t met all of the terms required for the coupon. Some coupons require that you need to purchase specific items or that you need to have a certain combination of items for the discount to be unlocked. Reading the terms before you try to use the coupon will provide you with more insight into how you should use it. Christopher & Banks offers a few shipping options to ensure that your items get to you within a reasonable amount of time. These options include standard ground shipping, expedited shipping, overnight shipping, and ShopRunner 2 Day shipping. If you are a member of the rewards program or you have the Christopher & Banks credit card, you can get free standard shipping every time you shop online. If not, you can generally waive the standard shipping fee by using a Christopher & Banks free shipping code whenever it becomes available. If you’ve been struggling to find your size in local stores or you simply haven’t liked the selection of clothing available near you, why not consider giving Christopher & Banks a chance? There are many CJ Banks locations throughout the country and you can find the one nearest you on the company’s website. In addition to providing an extensive variety of sizing options to choose form, all of the clothing available at Christopher & Banks is very affordable, making it a great option for anyone who is seeking to add a few new garments to their wardrobe with a budget. Factor in a Christopher & Banks coupon and you’re certain to find plenty of great deals while you shop!